Discover the Aeolian Archipelago on this day trip to the islands of Stromboli and Panarea from Taormina. Journey to each island by motorboat, exploring the local shops at your leisure or taking a cool dip in the sea. Afterward, cruise around Stromboli to see the island’s volcano. Keep your eyes peeled for the crater of Sciara del Fuoco, known to light up the sky with its jet-like eruptions. After a full day of touring the UNESCO-listed islands, you will return to Taormina. Hop aboard your coach in Taormina and travel north to the Port of Milazzo. After roughly an hour’s ride, board your motorboat and glide through the Tyrrhenian Sea to the island of Panarea, nestled in the UNESCO-listed Aeolian Archipelago. Enjoy time to explore the small, scenic island at your leisure. Wander the local shops in the whitewashed village, try the island fare at a café or take in views of the water from the beach. Afterward, reunite with your host and head across the water to Stromboli, named after its active volcano. Check out the black lava-sand beach and soak up additional free time to roam the village. Back on your boat, you can enjoy a light dinner as the sun sets (own expense). 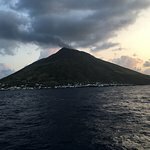 Top off your trip with an evening boat ride around the island to see Stromboli’s volcano in action. Head to a clear spot to view the crater of Sciara del Fuoco, where you'll witness bright, liquid lava explode into the night sky. Small eruptions typically occur every 30 minutes, so be sure to have your camera ready. After a full day of sightseeing, you will be returned to Taormina. Not value for money. Very disappointing. Beware of Aeolian day trip to Stromboli and Panorea. Get quick answers from Aeolian Islands Day Trip from Taormina: Stromboli and Panarea staff and past visitors.